Don and I grew up in Iowa, raised a daughter and two sons, and are now the proud grandparents of 9 grandchildren ages 1 thru 13. The focus of our lives is to share the gospel and see souls saved by faith in Jesus Christ their Savior. For many years we did tract ministry, street evangelism and a prison ministry. Prior to becoming full time missionaries we had several short term trips into different areas of Asia. The call to become full time missionaries to Liberia, West Africa, came on a cold winter night in January, 2006, when God used an old Liberian woman named Florence Williams who now lives in Iowa, to open the door for us to begin serving in Liberia. She had prayed years for someone to give the gospel to the people of her war ravaged country and bring them to Christ. After much prayer and seeking the will of God, the direction was clear what our Lord Jesus desired for our lives so we left family, jobs, and home to serve Him full time in West Africa. In January, 2007, we loaded our 94 Dodge 4WD truck (the locals call it "Jungle Truck" because it has proven to be so tough and not break down), in a 40' container along with a Jayco, Baja heavy-duty off road pop-up camper we purchased, bibles, donated clothing, school supplies, food from "Kid's Against Hunger", our personal supplies and we headed for Liberia in March, 2007. 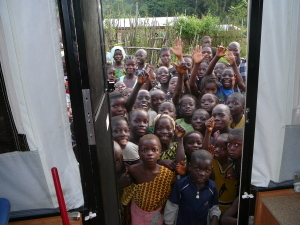 The first 7 months mainly revolved around the capital city of Monrovia as we waited for our container. God began our ministry to the street youth (estimated 60% population under 15 y/o) on the beach the first week we were there. We called it "Beach Preach". Many came, listened (drawn at first by 2 white people on a public beach) but then drawn by the Holy Spirit as God worked on their hearts. 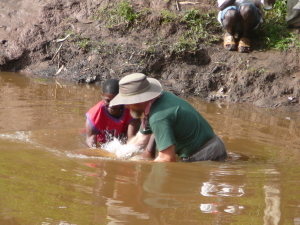 Many were saved and baptized in the Atlantic Ocean. To God alone be all the glory. During this time we also worked with some local churches teaching the leadership, preaching at the prison, and traveling to villages with established churches to teach and share the Word of God. During this time we also worked with some local churches teaching the leadership, preaching at the prison, and traveling to villages with established churches to teach and share the Word of God. 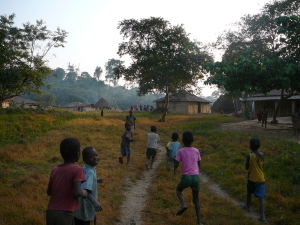 At the end of the rainy season in early October we left for the interior areas of Nimba County knowing the greatest need for the gospel was there. You will find many churches in the costal cities but few, if any, in the interior villages so we felt called and needed in these areas. Although the roads are horrendous (20 years of civil wars) we traveled into the bush, living among the people and sharing the Good News of Jesus Christ. Immediately God blessed this endeavor showing us men, women and children desiring to hear about our Lord. Many of them were deeply involved in witchcraft and sorcery. When Paul's conversion began on the road to Damascus, the Lord said in Acts 26:18, " open their eyes, in order to turn from darkness to light, and from the power of Satan to God, that they may receive forgiveness of sins and an inheritance among those who are santified by faith in Me." 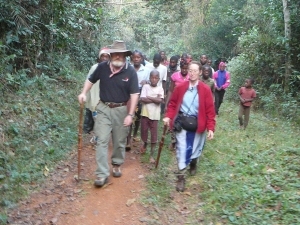 We planted our first church in the Republic of Guinea in November, 2007, and now have a total of 5 churches in Guinea. 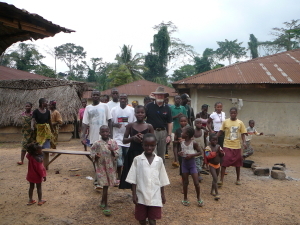 Our ministry in Liberia flourished with 14 churches and many other villages desiring us to come and tell them of Jesus. A door has opened in both countries to minister the Word of God. In Isaiah 49:6 the promise from God is that our Lord Jesus would be a light to the Gentiles and He would bring salvation to the ends of the earth. We are blessed and humbled being a part of the great commission to preach the gospel to the ends of the earth, therefore, in obedience we go. The need is great for the training of church leadership. 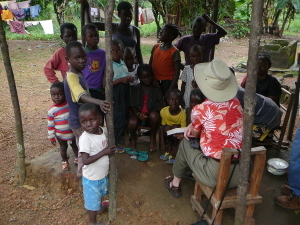 We are praying and seeking God to help us establish a Bible school. We have named it "Crucified with Christ Biblical Institute of Studies". 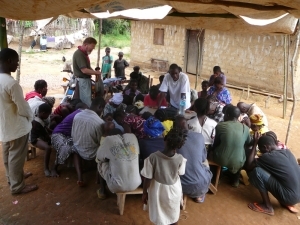 Week long intense training has been provided to two groups of village church leadership totaling 50 people. They have no funds to attend a school or to leave family and farms for an extended time so we provide transportation, food, and school supplies for an intense one week session. We were blessed with the first book in a series designed for interior churches by" International Christian Mission Ministry", (ICM), on the "Fundamental Truths of Christianity" that walks them thru the Bible and teaches them from Creation to the Second Coming the doctrines of our faith along with the scripture references. This is the curriculum we will continue to use. It will take 2 to 3 sessions for most groups to complete book one. We pray for land and a structure as rainy season comes and the numbers grow. There is a great desire among the leadreship as well as the people to grow, learn about their faith in Jesus, and to share it with others.